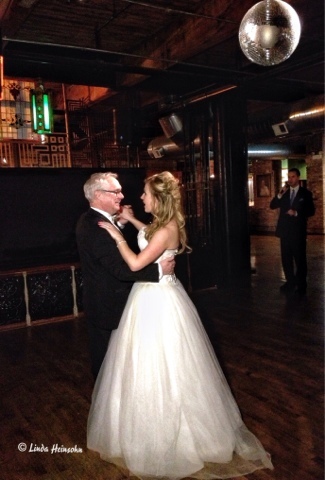 Feeling sentimental today about our BIG weekend in Chicago for my daughter's wedding. Here's one of my best captures of the evening. Oops! Forgot to say post was done in Snapseed except for the ©. A feature in Snapseed I love is the ability to click on a spot or area on the photo and change the selective brightness and (I think I remember it right) the detail visible there. You can also scale the size of that spot up or down. That's cool because I liked that I'd gone to the trouble of composing the crooning DJ into the frame but he was so dark you couldn't really see him unless you knew to look there. With the Selective Adjust feature, I clicked on his upper body, dialed up the brightness and he appeared! Not too bright; not too dark. Just right. Thank you Snapseed and, oh, I LOVE you! Good job Linda! Was this taken with your iPhone? Hey, Judy! Thanks for commenting and YES, I took this with iPhone. Not bad, eh? I took my big girl camera with me on the trip but put it away on wedding day as I didn't want to worry constantly about theft with all else that was going on that day. So far, 100% of my recent blog posts are from iPhone or iPad. Did you see my great dog face from last week? If I'd had to get out my regular camera, take off the lens cap, turn it on, I would have missed the shot. Once he saw me focus my phone on him, he was up sniffing at my face. So I only got a second's worth of a chance to capture him in repose.